You are looking at a BRAND NEW. 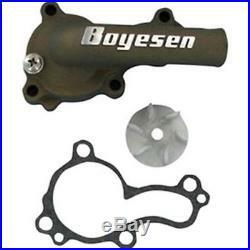 Boyesen Supercooler Water Pump Cover & Impeller Kit in Magnesium. Boyesen Supercooler Water Pump Cover & Impeller Kit. Does not include new gasket. Overheating, cavitation, and poor coolant circulation can mean excessive wear and damage to components. Use the Boyesen Supercooler Water Pump Cover and Impeller Kit and youll get superior cooling that keeps your bike running at its best. By increasing the coolant passage size, creating a high-flow impeller, and smoothing all interior surfaces to reduce friction, the Supercooler pumps out more coolant at a faster rate than your stock water pump. The Boyesen cover looks great but it keeps things simple too since it has the same footprint as your stock unit. No need for any special gaskets or fitment. Just bolt the Supercooler up like its stock. With high-revving, hard-working dirt bike and ATV engines, temperature management is key to keeping your machine running well. Make sure you have the parts to keep it that way with the Boyesen Supercooler Water Pump Cover and Impeller Kit. High efficiency water pump and cover for increased engine cooling. Investment cast from aluminum alloy for lightweight strength. Same footprint as stock parts for bolt-on installation without special gaskets or fitment. High-flow impeller moves more coolant than stock parts. Less cavitation on impeller means better efficiency and longer impeller shaft life. Higher flow rate with larger diameter passages and low-friction internal surfaces. Terms and Policies:PLEASE READ! Thank you for your interest. Reading this before or after purchasing may answer any questions you have. If not, feel free to contact me! The primary two being Utah and Kentucky. Simply check 2 day or Standard Overnight during checkout. Once your order is processed, you will be sent a detailed message providing you with information on your order. However, a sur-charge is added. This is unavoidable, please be considerate during these events. I dont make these decisions. They cannot be modified as I do not collect those costs. This means that stock is always fluctuating and the current inventory in the listing may not reflect the actual inventory. This is a rare occurrence but does happen on occasion. B: The rare event that you were sent the incorrect item or the item you received is damaged/defective. In the event this happens, dont sweat it. Ill make sure to get you taken care of. Please do not return an item without first contacting me. It will save us both a hassle. You will be asked for some information. Usually a part#, description of your issue, and a photo. Once the problem is identified, the necessary actions will be taken to get your issue resolved as efficiently as possible. All items are fully described to the best of my ability. If there are any questions or youre confused about something. Do not hesitate to ask! -Most photos are stock/generic photos. This means that the photo may be of the part listed, but for another machine. It also may display multiple items for different machines. Rest assured, you will receive the part described in the quantity stated, for the make, model, and years listed. If for any reason there is an issue with your order, please contact me. I realize I cant please everyone, but I promise Ill do my best to fix any issues. Thank you for your consideration. I will do whatever I can to fix any problems or issues you may have with an order should any problems or issues arise. As an avid rider myself, I understand this is an expensive hobby and I try to provide fair prices and the best possible purchasing experience I can. If you didnt, simply send a message and Ill do what I can to get you taken care of. I appreciate all my customers. Keep it rubber side down! The item "Kawasaki KX450F 20062015 Boyesen Supercooler Water Pump Cover Impeller Kit" is in sale since Monday, November 2, 2015. This item is in the category "eBay Motors\Parts & Accessories\Motorcycle Parts\Engines & Engine Parts\Other Engines & Engine Parts". The seller is "motofrenzy" and is located in Payson, Utah. This item can be shipped to United States, Canada, United Kingdom, Denmark, Romania, Slovakia, Bulgaria, Czech republic, Finland, Hungary, Latvia, Lithuania, Malta, Estonia, Australia, Greece, Portugal, Cyprus, Slovenia, Japan, Sweden, South Korea, Taiwan, South africa, Thailand, Belgium, France, Hong Kong, Ireland, Netherlands, Poland, Spain, Italy, Austria, Israel, Mexico, New Zealand, Philippines, Singapore, Switzerland, Norway, Saudi arabia, Ukraine, United arab emirates, Qatar, Kuwait, Bahrain, Croatia, Malaysia, Brazil, Chile, Colombia, Costa rica, Dominican republic, Panama, Trinidad and tobago, Guatemala, El salvador, Honduras, Jamaica, Germany.